Without dieting being forced down Ren Mei’s throat, she has finally found the will to try her best to lose weight. Unfortunately for her, she chooses the unhealthiest method to go about it. She faints from not eating and overworking which sends the worried Granny Zhao flying to the Long house. Also rather unfortunately, Ren Mei uses a poor choice to defend the Longs by saying they at least treat her like family. Well…there isn’t anything wrong with her pointing that fact out as it is very true that she’s treated more like a family member there, but it was the wrong thing to say at that time when Granny Zhao obviously was very worried about her granddaughter’s health. Zhao tells Ren Mei that she was going to take her back to the Zhao house, but since Ren Mei likes it at the Longs’ she can stay there and “suffer.” She huffs out as Ah Pan brings the doctor in. Later Long tells Ren Mei that while Zhao appears to be hard, she does have a soft heart and loves Ren Mei very much. Ren Mei replies that she does know this. Long then says that it was her poor diet that caused her to faint, thus he doesn’t want her to diet. Well, if she did it properly, she wouldn’t have had that issue. Ah Pan and Lao Tu are standing and eavesdropping on the conversation to figure out why Ren Mei wishes to lose weight, however, the young girl is not forthcoming with Long as to the reason she was trying so hard. Tai comes up and wonders what the servants are doing, scaring them. Ah Pan then turns on Tai and says Ren Mei’s sudden desire to lose weight must have been because he constantly bullied her. Tai retire back to Tian He’s room and worries that maybe he was the cause, but to him he didn’t bully her and only told her like it really was. Later when he goes outside he overhears Ren Mei talking to her ballerina snow globe. She feels that she is a failure who can’t even lose weight without upsetting people and causing trouble for others. All she wanted to do was lose weight to meet her Aunt Kate and to maybe, possibly, put on the slippers left behind by her mother and take up ballet once more. Hearing all of this, Tai recalls his mistreatment of her ballet slippers and feels badly. The next morning Tai wakes Ren Mei up bright and early an takes her to the market where he points out different foods and rattles off all of their calories. This amazes Ren Mei and Tai laughs off his knowledge as something common and Ren Mei just being stupid. The truth his he spent hours researching the information for Ren Mei. He then lays down dieting law—lower calorie intakes with less carbohydrates and fried foods. This makes Ren Mei not very happy as that means there’s a lot she can’t eat and what she can’t eat will taste horrible. Tai says that diet food doesn’t need to taste bad. I must say that when it comes to lower fat and healthier foods…I haven’t met one that wasn’t bland or felt that it was lacking. Although…Lean Pockets aren’t too terrible tasting, but I really don’t know how healthy those really are for you. Anywho, to prove Ren Mei wrong, Tai makes a special diet meal and presents it to the Longs at dinner. Ren Mei gives the dishes a taste and is pleasantly surprised that it actually tastes good. Tai then tells her it will be up to her to prepare her own meals now. This quickly earns him a scolding from everyone else as Ren Mei will need all the help she can get to maintain her diet. Long decides to help track her calorie intake while Lao Tu will be in charge of her exercising and Ah Pan will scrub the baths down for Ren Mei to soak in to help stimulate her metabolism. All Tai has to do is keep cooking Ren Mei’s meals. Tai reluctantly agrees to this. Then Ren Mei reveals she doesn’t like hot springs as she became afraid of their heat after getting larger. This makes Ah Pan and Lao Tu laugh. Long shuts them up and says no one will make fun of Ren Mei. Tai pipes in and says that she can choose what she wants to do in order to lose weight. Thus starts Ren Mei’s healthier dieting and exercise regime. Ah Pan and Lao Tu work her hard on her exercising while Long diligently records her calorie intake and Tai prepares all of her meals. Ren Mei finally decides its time to check her weight loss progress. She thinks that stripping might make her lighter (true, clothes can make your weight heavier, but not too much so), but then decides she shouldn’t lie to herself and goes over to the scale fully clothed. She closes her eyes and steps on the scale. She then opens her eyes and carefully looks down. She is happily surprised to see that she is starting to lose weight. Ren Mei has lost a total of 3 kilograms. If this continues, she will definitely be able to see Aunt Kate. Ren Mei then gets an email from Kate saying that she is coming even earlier. She only has a month to slim down. How will that be possible? Ren Mei then recalls Ah Pan’s advice about how the hot spring soaking can really help stimulate the metabolism and slim her down. Ren Mei then imagines soaking in the magical waters and becoming magically slimmer. Not realistic at all. Thus, Ren Mei decides to face her fear of hot springs and goes out to bathe. She goes into the spring and water starts splashing out. Ah Pan goes to clean the spring and is shocked to find water all over and the water level down quite a bit. Just what happened? Ah Pan quickly goes to see Tai who is preparing Ren Mei’s room. She tells him about going to the women’s springs and seeing the water all over and then following the footprint trail to Ren Mei’s room. The young girl refused to open the door and swears she will never come out again. Ah Pan is really afraid that Ren Mei might be losing her mind while trying so hard to lose weight. This worries Tai and he goes to Ren Mei’s room himself. He goes to knock when he sees a letter sitting outside of her door. Curious, he picks it up and reads it. Ren Mei says she is locking herself in her room to concentrate on getting thinner since Aunt Kate is coming sooner. Ah Pan and Lao Tu come up and ask if they should break the door down. Tai says no as it’s just that Ren Mei has gotten serious at last. What happens if she passes out again or gets hurt? Long comes and says that if that should happen, then they will intervene, but until then, they should trust in Ren Mei. The girl lies in bed hungry. she fantasizes about eating all of her favorite, fatty foods. She cuddles with her pillow as she tries to clear the fantasies from her head. Meanwhile, Tai is worrying over Ren Mei. Ah Pan thinks its bad for Ren Mei to do this on her own without support or praise. Lao Tu thinks its okay as long as there is a mirror and a scale, Ren Mei will do fine. Tai recalls Ren Mei saying how much she doesn’t like looking at herself in a mirror. He then gets up and starts looking for a mirror, but Tian He’s room doesn’t have one. Tai then finds a picture frame made of glass that sort of works. Tian He goes to Ren Mei’s room with the picture frame and slides it under her door. Ren Mei then asks if he has moments of weakness. The two then end up sitting on opposite sides of the door and having a conversation. Ren Mei is saddened by how weak she is. Tian He says everyone has moments of weakness. He chooses to think about happy things to get over his. Ren Mei then says that while it is horrible, right now her eating and drinking whatever she wants would make her happy. This annoys Tai. How can that girl only have food on her brain? He then says as long as she’s only thinking about it and not acting on it, that’s okay. This brightens Ren Mei up considerably. She then says she wishes to go to a night market. Tai doesn’t know what’s so good about one since he grew up in Japan. Ren Mei at first finds it odd that Tian He knows nothing about a night market, but that’s right, he was ill growing up and didn’t get out much. Whew. He caught a lucky break with that one. Ren Mei then decides to take Tai on a self-guided tour of a Taiwanese nigh market (after wondering why all of the good foods he mentioned he wanted to eat were Japanese). Okay, she’s not physically taking him. It’s a…virtual tour of sorts. So you get to have a very cute date with Tai and Ren Mei eating everything in sight. Ren Mei finds the fantasy very fulfilling, but Tai not really so. Having never been there, he can’t imagine something like she described. She then asks him what he’s thinking about and Tai smiles as he imagines Ren Mei and he wondering the streets of Japan in yukatas. 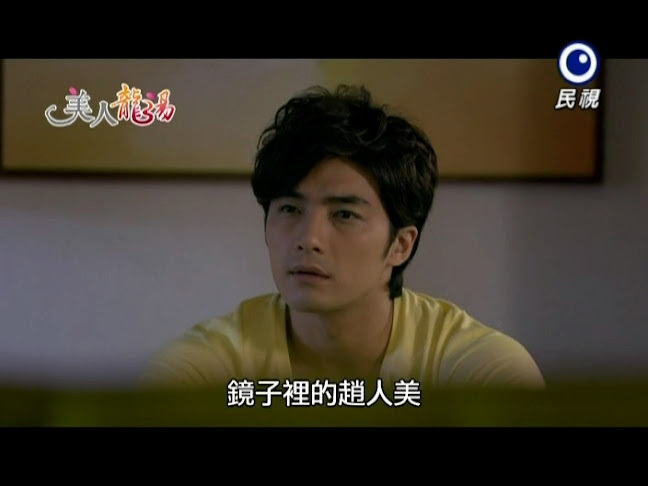 He then asks Ren Mei if they should go to a night market; however, he gets no reply since Ren Mei is fast asleep. We then get a countdown of Ren Mei’s calories and dieting and see her dropping weight succesfully. The day comes for her to reveal her slimmer self and the Long family are all nervously waiting and wondering when she will come out of her room. Tai says that he must be very nervous as his stomach feels weird. Lao Tu and Ah Pan both tell him there’s no need to be nervous and then ask him to get the car to take Ren Mei. Car? What car? How could Tian He forget about the motorcycle his father bought him after he got into college? Right….that car. I still can’t believe Lao Tu and Ah Pan haven’t figured out that Tian He is not Tian He. Tai goes out to a shed and uncovers the motorcycle. However, before he can take it out, his stomach starts acting up and he bolts for the bathroom. Meanwhile, Ren Mei finally reveals her transformed self. Ah Pan cannot believe that such a beautiful and cute girl is their family’s Ren Mei (I love how they have adopted her as part of the Long family). Ren Mei tells Ah Pan to stop exaggerating—she only lost weight. Truthfully, even as the chubby Ren Mei, she was still pretty. Lao Tu says it isn’t an exaggeration as Ren Mei is very beautiful. Long then praises Ren Mei for her hard work finally paying off. Now she can happily go see Aunt Kate. Now…where’s Tian He? The poor boy is running in and out of the bathroom with stomach problems. Lao Tu then comes and says the motorcycle is out front, but Tian He is nowhere to be found. Long tells her to wait for Tian He, but Ren Mei doesn’t want to bother him and leaves to take the bus. 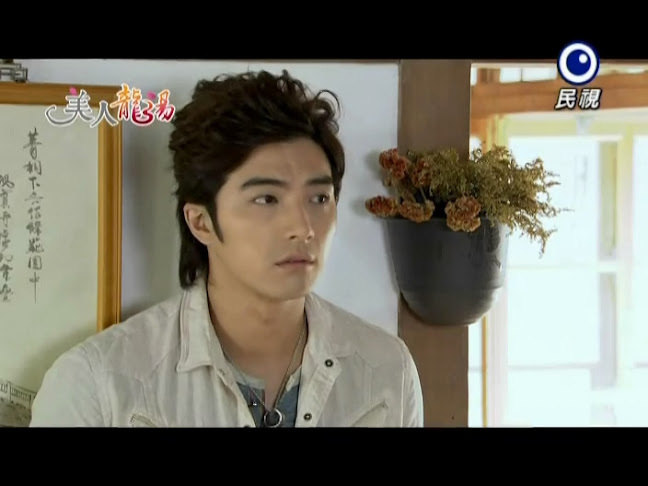 Tian He finally makes it out of bathroom to learn from Ah Pan that Ren Mei has taken off already. She warns Tai to hurry and pick her up as she is thin and pretty and could definitely be picked on by perverts. Imagining this, Tai hurries and rushes off where he gets a shock to see the transformed Ren Mei—is that gorgeous creature emitting hearts really the meat bun girl? Tai gets off the motorcycle and can only stare at her. This confuses Ren Mei—why is he staring. Is Tian He there to take her to see Aunt Kate? Tai finally comes to his senses and then says he is of course not there to take her. Ren Mei then gets on the newly arrived bus and Tai comes to his senses yet again and wonders why he didn’t tell her he was there to take her. He gets on his motorcycle and rushes after the bus where Ren Mei is depressed about meeting Kate since she hasn’t kept up on ballet at all. Meanwhile, Tai rides next to the bus the entire way. Ren Mei gets to the meeting place and happily greets her aunt who wraps her in a big hug and compliments how pretty the girl has grown. The two sit down and Kate apologizes for only contacting Ren Mei now, but she has just finally found the address after all these years. Ren Mei says that is okay as she was really afraid of disappointing her aunt. We then cut to see Tai watching the meeting from outside. He’s happy that Ren Mei was able to meet her aunt. When he sees them heading outside, he quickly rushes and hides. After Kate leaves to attend her meetings, Ren Mei flashes back on their conversation where Kate urges her to not give up on dancing as Ren Mei has real talent. Ren Mei then reveals she hasn’t danced since she was six-years-old. Kate replies that even so, it may not be impossible for Ren Mei to get back up to snuff and continue her dancing. Kate tells Ren Mei that as long as she wishes to, then Ren Mei can do it. Ren Mei smiles sadly. Kate then says that in the past Granny Zhao was against Ren Mei’s dancing, but now Ren Mei is an adult who can decide her own future. Kate then hands over her business card saying that she will be staying in Taiwan to teach and encourages Ren Mei to look her up. Of course, Ren Mei doesn’t believe that Kate was being honest at all and decides to give up before even trying. Tai comes flying and sees Ren Mei leaving and then goes running off again. Why? So he can casually pretend to run into her. Too bad he’s completely out of breath which makes his lie a little unrealistic. Ren Mei asks why he’s sweating so much and Tai lies and says it’s a hot day. Ren Mei says it really isn’t. He then asks after her meeting with Kate. Ren Mei says nothing and only continues to play with Kate’s card in her hands. Tai then offers to take her home. Ren Mei doesn’t want to impose, but Tai immediately gushes out that he only came to pick her up in fear of Ah Pan’s wrath. So he came to intentionally pick her up then. How did he know where to pick her up—did he follow her? Yes, but Tai won’t admit it and only yells she doesn’t have to go back with him if she doesn’t want to. Ren Mei goes to put on the spare helmet and ponders why Tian He has suddenly become so nice to her. Tai turns and notices her fumbling with the helmet’s buckle. He then says it’s horrible that the more he looks at her, the more he’s mesmerized. He then scolds her for not being coordinated and quickly fastens the helmet for her. Their eyes meet and we get a soft love song. Yep. These two are falling for each other. At the Long house, Shou Ceng gets a call from Japan from Tian He’s doctor. He tells the doctor to wait and carefully closes up his room so no one can overhear the conversation. He then says he always wanted to contact the doctor and asks how his son is doing. The doctor says that Tian He still might have to under go a surgery, but right now he’s responding well to the medication. The doctor says that he still feels uneasy thinking about Tian He’s mother. They should use this time to find her so that she can meet her son and help heal his scars. Long sighs—unfortunately it is too late for that. We then get to see the real Tian He for the first time in a long time. He weakly gets out of bed as the doctor hangs up with his father after promising to keep the secret. The doctor then goes to Tian He’s room and finds him gone. Atsuko is at the Long household in Japan looking for Ryuta. Where could he have gone? She looks over where she happens to see Tian He. She immediately rushes after him calling out Tai’s Japanese name. He disappears around a corner and she wonders why Ryuta would ignore him. But then again, he doesn’t dress like Ryuta—could she have recognized the wrong person? 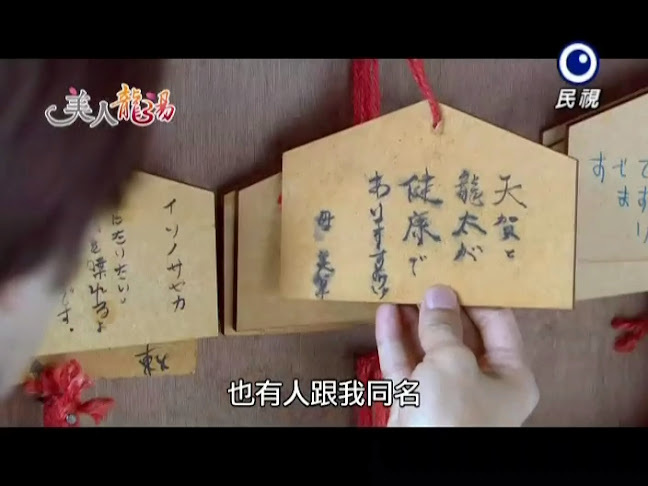 Tian He goes to the nearby shrine where he looks at the wishes and notices the one his mother wrote about him. Who knew there’d be someone in Japan with the same name as him. At the Long household, they celebrated Ren Mei’s successful weight loss. Ren Mei says that if it wasn’t for their help and encouragement she wouldn’t have been able to do it. Lao Tu tells her it’s also due to her hard work and determination. Ah Pan then says that the villagers were surprised to see such a pretty and thin Ren Mei and that they want to quickly find her a boyfriend. This news causes Tai to choke on his rice. They tell him to be more careful. Lao Tu says there is no need to find her one as the boys will line up for her. This makes Ren Mei smile. Long then tells her to go out and make some new friends. This irks Tai more and more. He then cant’ hold his annoyance any more as Ah Pan tries to set Ren Mei up with a friend’s son. He slams down his bowl and yells. Everyone gives him an odd look and Tian He quickly cover sand says that Ah Pan made too much food as Ren Mei has only just recently slimmed down. He then says something very tactless about not helping Ren Mei lose weight next time. This immediately saddens Ren Mei. She puts down her food without eating much and excuses herself from the table. On her way out, she trips over the dress she is wearing and nearly face plants. Tai scolds her for not wearing more suitable clothes. Ah Pan interjects and says Tai is too cruel. However, Long agrees. Now that Ren Mei has slimmed down, she should buy some more suitable clothes for herself. Ren Mei looks down at what she’s wearing and says she doesn’t know what clothes suit her. 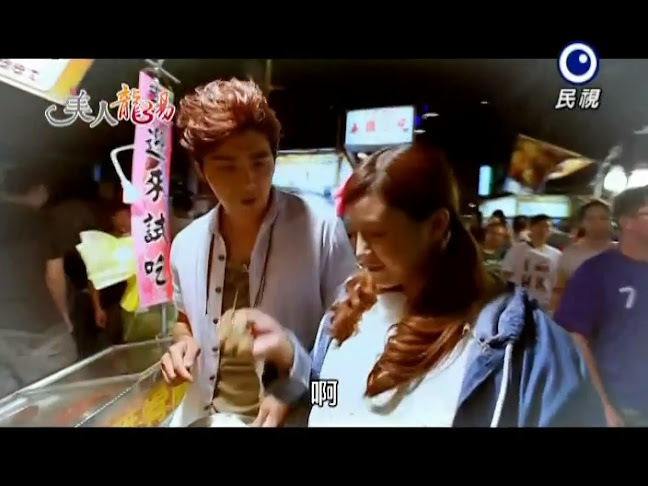 Ah Pan and Lao Tu then volunteer Tai to go shopping with her. Tai is not happy about this at all—why does he have to go? He’s young as well, so he should know what’s good. The next day Tai takes Ren Mei shopping. The two get on a crowded elevator. One man rushes up just as the doors are closing. The overloaded buzzer sounds and Ren Mei immediately apologizes and goes to get off. Tai quickly grabs her and pulls her in—it’s obviously not her fault. He then tells the man that just got on to get off since he was the last to arrive. The man refuses as he’s in a hurry. Tai then yells at him and pushes him out. Soon the entire elevator empties as people became afraid of the fierce Tai. Later Ren Mei scolds him for overreacting and Tai again complains about her horrible lack of confidence and allowing herself to be easily bullied. She’s not fat any more and should be more confident in herself. Ren Mei says she understands and then asks why he’s being so weird of late. Tai looks down and notices he’s holding on to her arm. 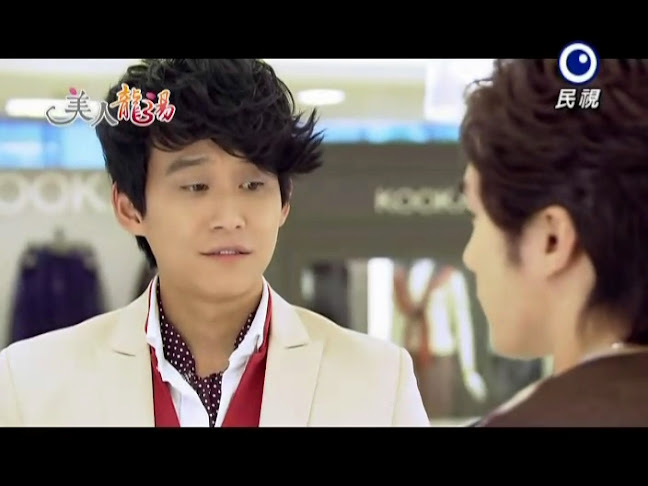 He quickly lets go and then tells Ren Mei to go and choose her own clothes. She does so, but he rejects every outfit that she picks out for herself. He then notices the last outfit she tries on and smiles happily. At the Long house there is a huge commotion. Ah Pan runs in to get Shuo Ceng and tells them they have a large group of customers. Lao Tu is doing his best to keep the struggling women back. Looks like after seeing Ren Mei’s dramatic weight loss, the chubbier female villagers are all hoping to use the springs to get the same effect. Long tries to tell them what happened with Ren Mei, but the girls break through and stampede into the springs. Long follows them and quickly turns his back and tries to tell them the rules. Ah Pan rushes in and says it’s okay, just let them be since it’s hard to get customers. Long doesn’t care as they do not cater to people without manners. Long’s yelling catches the girls’ attention and they angrily go to leave. Ah Pan apologizes and tells them to come again. 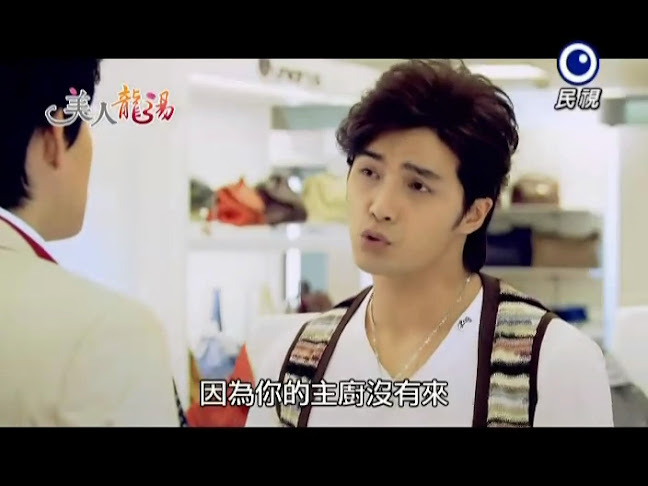 Ah Pan complains about Long not wanting to make money and Lao Tu reminds her their boss hates uncouth people the most. They then rush to the women’s spring where they find him cleaning furiously. The two quickly take over. At the mall, Ren Mei is amazed that she can wear such pretty clothes. She then runs into her grandmother and their assistant. Seeing this unexpected appearance, shocks the Zhao women and they drop their bags. Ren Mei rushes to pick up the bags. Tai excuses himself and Granny Zhao sends the assistant away. Zhao is amazed and happy to see that Ren Mei has finally lost all of that weight and can move freer now. She then recalls the past and how harsh she was to Ren Mei (forcing her to eat nothing but steamed vegetables and clean furiously non-stop). Zhao is curious as to what finally made her lose weight. Meanwhile, Ren Mei recalls what she told her grandmother about feeling like an outsider in the Zhao family. Zhao then says that Ren Mei slimmed down without the help of the Long family, right? Nope. Without their help and support, Ren Mei would never have been able to do it. This doesn’t make Zhao happy at all. This makes Ren Mei sad. She finally slimmed down—why isn’t her grandmother happy? Zhao replies that she feels like slapping someone right now, so of course she isn’t all right. Poor Ren Mei is confused by this. Zhao goes to angrily leaves and almost collapses. When Ren Mei goes to help her, she shoves Ren Mei away and continues on her way. Meanwhile, Tai is worried about Ren Mei—the girl should be fine, right? He then runs into Ren Hu who immediately starts verbally attacking him. Who knew an ill bookworm would shop at a department store? Ren Hu then comments on Tian He’s improved health and spirits. Tai complains about Ren Hu’s attitude. He has already seen through to Ren Hu’s inferiority complex. Ren Hu then lays out a list of all of Tian He’s sins (like stealing the limelight at the dragon dance and the cooking competition). Tai still doesn’t get Ren Hu’s anger. Ren Hu then talks about Tian He bringing the girl Ren Hu liked into the battle. Knowing that Ren Hu liked the girl, Tian He confessed to her and then immediately dumped her after Ren Hu left to study in the states. 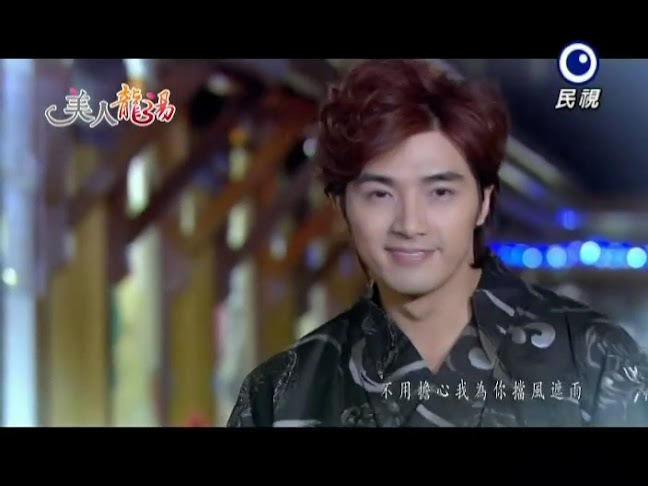 Ren Hu then vows to get his revenge. Even though what Tian He did was very low when they were in college, still…doesn’t explain the level of Ren Hu’s hatred. Ren Hu goes to leave and sees the weak Granny Zhao. 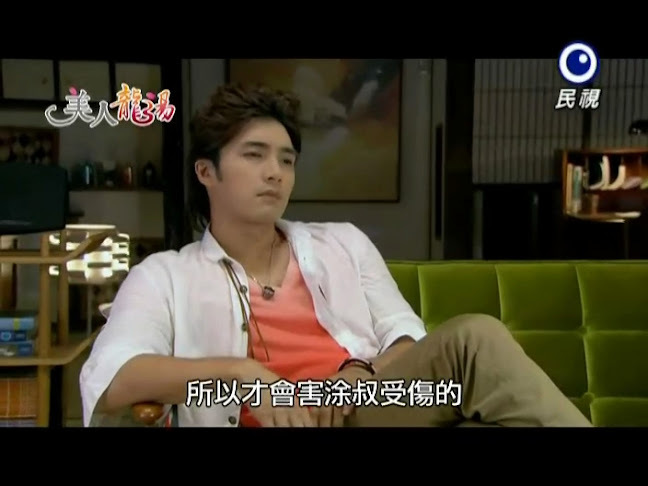 He asks what happened and out runs Ren Mei apologizing. The two help Zhao to her car. Ren Hu then angrily turns on his little sister and demands to know how she made their grandmother so angry. He then leans in close and whispers that Ren Mei already killed their parents—is she trying to kill their grandmother now, too? Argh. Nylon Chen I am really hating your character. Granted, that was a very traumatic event, but Ren Mei is innocent. Accidents happen all the time for no reason. He should be reaching out to his only remaining family, not condemning them and treating them so cruelly. Sigh.